An in ground basketball system is the perfect type of goal for your backyard basketball court if you're looking for something sturdy and relatively permanent. In general, you'll find they provide better stability, durability, and performance than a typical portable basketball hoop. However, unlike a portable goal where you can be ready to play in just a few hours, an in ground goal is pretty labor intensive to install. You will have to dig a hole, mix up concrete, erect and level the pole, and let it set for 72 hours before it's ready to use. Most in ground systems are available in either a standard, bolt-on, or ground sleeve variety. With the standard system, the pole itself is secured into the concrete, resulting in a very stable but very permanent goal. The bolt-on variety, on the other hand, uses an anchor system which is cemented into the ground. The pole is then bolted to the anchor, so that the goal can be removed if necessary, leaving only the anchor behind. You may also choose to insert a ground sleeve into the hole and slide the pole into the sleeve as opposed to burying it in concrete or using an anchor. 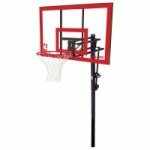 As with most basketball equipment, you can spend as little or as much money as you want on your basketball goal. Just keep in mind that you definitely get what you pay for in terms of quality, durability, and performance. You can find in ground basketball hoops at all ends of the spectrum, from as low as a couple hundred dollars on up to the thousands. 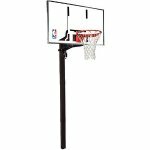 The amount you spend depends in large part on the type of backboard and basketball rim you select as well as whether you want an adjustable or a fixed-height goal. Fixed-height goals tend to be less expensive than adjustable ones. In addition, cheaper models have lighter-weight poles that come in 2-3 sections. This may make them easier to transport and assemble, but they won't be as strong as the heavy-weight poles that come in one single piece. In ground systems tend to weather better over time also. Unlike portable basketball hoops that get bent up, lopsided, and worn out over time, in ground systems endure the elements better and look good longer. One accessory you might want to consider, especially if you've got kids who play pretty hard, is a pole pad to protect players from hurting themselves if they run into the pole. These pads come in a variety of thicknesses. 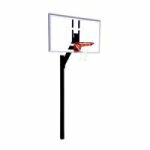 For other types of goals, basketball rims, accessories, and training aids browse Basketball Equipment where you'll find just about anything you need to play this game.